Wells Fargo settled a lawsuit filed by the city of Memphis claiming the bank targeted minorities for predatory lending. NEW YORK (CNNMoney) -- Wells Fargo has promised $432.5 million in new loans and financial assistance to settle a lawsuit filed by the city of Memphis claiming the bank targeted minorities for predatory lending. In a statement Tuesday, the bank said it will pay $3 million to the city and county to support economic development and $4.5 million in grants for mortgage down payments and home renovations. Wells Fargo has also set a lending goal of $425 million for residents of Memphis and the surrounding Shelby County in Tennessee over the next five years. This figure includes $125 million earmarked for low- and moderate-income borrowers. A Wells Fargo spokesman said the lending goal is "very achievable" based on the amounts the bank has lent to borrowers in the area in previous years. Memphis and Shelby County sued Wells Fargo (WFC, Fortune 500) in 2009, accusing it of targeting African-American neighborhoods in the area for deceptive, high-priced loans dating back to 2000. As a result, the suit said, these areas have faced a disproportionate amount of foreclosures and declining property values. Wells Fargo, meanwhile, allegedly avoided risk on the loans by selling them on the secondary market. Former employees claimed bank staff referred to subprime mortgages in minority communities as "ghetto loans," the lawsuit said. "The condition of the local housing market continues to challenge Memphis and Shelby County significantly, as unoccupied homes and excessive housing inventory weigh heavily on communities," Memphis mayor A.C. Wharton said in Tuesday's statement. "We are pleased to announce this collaborative partnership to get more of these houses reoccupied and increase neighborhood stability." Wells Fargo denies the allegations in the suit, saying it is committed to "fair and responsible lending practices." "We agreed that it was in the best interests of everyone involved to work together rather than to continue to be involved in a protracted legal fight," Leigh Collier, Wells Fargo regional president for the Mid-South, said in the statement. In December, Bank of America (BAC, Fortune 500) paid $335 million to settle allegations by the Justice Department of discriminatory lending practices at Countrywide Financial. 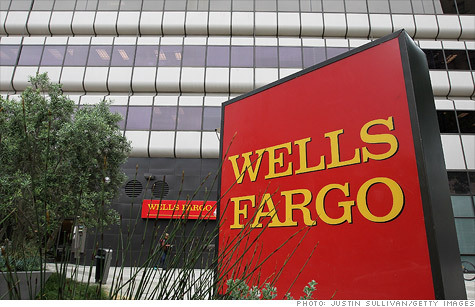 In a filing with the Securities and Exchange Commission earlier this month, Wells Fargo said that it, too, was under investigation from the Justice Department for allegedly violating fair lending laws and could face civil claims as a result. "We believe such claims should not be brought and continue seeking to demonstrate to the Department of Justice our compliance with fair lending laws," the bank said.